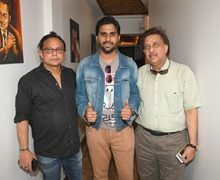 A film by Jayam Prakash; Producers: Dr. Yatinder Singhal and Sarita Singhal, Singer Aman Trikha recorded a beautiful romantic sufi song for the film “MAACHIS” . The recording saw the presence of Aaman Trikha, Jayam Prakash, Dr. Yatinder Singhal and Sarita Singhal, Praveen Bharadwaz, Miraq Mirza, Arun Bakshi, Vipin Aneja, Shomu Da & many more. The song is high on its musical richness, its subtlety and its uncanny ability to reach deep within our hearts of the audience. The song will make everyone embark into a blissful world of tranquil music & magnificent ambiance.